We are an Outdoor Adventure and Environmental Education program for school groups at Camp High Rocks. Our focus is on teamwork, experiential learning, and environmental education for your school! We offer purposeful and effective outdoor education and adventure programs for youth, grades 6-12 in the mountains of western North Carolina. Teamwork: Group initiatives, high and low ropes courses, and communication exercises teach students life lessons. Experiential Learning: We offer rock climbing, canoeing, and several other activities that allow for hands-on learning with immediate feedback in a real environment. Environmental Education: Stream ecology, Mountain Flora & Fauna, and other sessions educate our youth on the delicate environment and how our actions impact the world around us. Our LEAP program embraces a philosophy that provides your group with an enjoyable and meaningful experience. Trying new things, trusting one another, and working through difficult situations as a team can help students develop confidence, good decision-making skills and a sense of social responsibility. By freeing them from the walls of a traditional classroom we can work with your students and integrate current curriculum and subject matter that will enhance their learning through experiential methods. During our graduation ceremony each year they get to tell us their favorite St. Andrew's memory and about half of them will say this senior trip. They are still talking about it years later during homecoming week too. It has become a rite of passage at our school. Some of them start out dreading it but they all come home loving it. 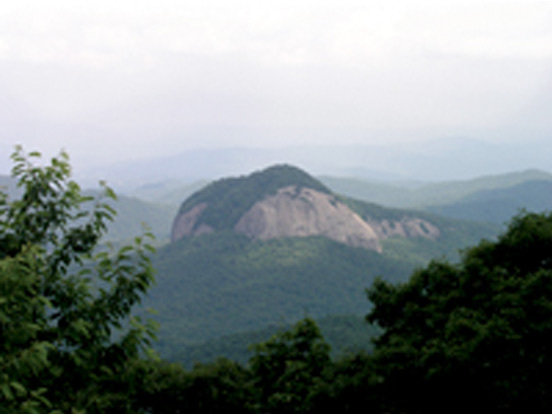 High Rocks is an authorized Special Use Permit Holder by the Pisgah, Nantahala, and Sumter National Forests.